Benchmark indices made new milestones last year in the month of March with the Nifty hitting the 9,100-mark and the Sensex moving past 30,000 levels for the first time, followed by a healthy correction of almost 25% from March 2015 till February this year. Later, with sentiments turning positive locally as well as globally, we have seen strong bounced back with sharp rally of more than 24% during last 5 months. The global financial crisis reared its ugly head and sent global economic growth and world stock markets including India into a tailspin. Suddenly there was nervousness all around. Forget bad stocks with bad fundamentals, retail investors in India were loathe to put in their money even in good companies available at attractive prices fearing that prices will fall down further. Then 2013 dawned, signs of recovery began to be noticeable and stock markets surged once again. And with stable government in place, major indices Sensex and Nifty continued to move northward making all time highs in March 2015.
Corrections in bull market are healthy and give opportunity to invest. Bull markets do test your patience and conviction. If you expect a straight-line appreciation in stock markets, that is not going to happen. Profit bookings at regular intervals bound to bring the indices lower. A lot of people who were left on the sidelines when the move was too fast got an opportunity to invest in equities at discounted prices during Jan and Feb this year. The idea really is not to time the markets. That is a feat best left to speculators. For long term investors, there will still be plenty of stocks that they can look to add on to their portfolios. These stocks if picked at the right price by proven approaches can turn into multi-bagger opportunities. We are pleased to share that Hidden Gems (Unexplored Multibagger Small Cap Stocks) recommended by us since inception have outperformed small cap index by wide percentage points ensuring much better returns for our members. As illustrated in the table above, average returns of Hidden Gems stocks released in 2014 is 131.2% compared to small cap index average returns of 35.5%. 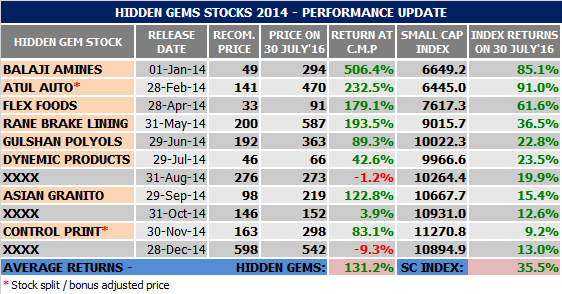 As on date, Hidden Gems stocks of 2014 are outperforming small cap index by whopping 95.7%. Total 8 Hidden Gems stocks out of 11 released in 2014 have already achieved their target price giving more than 100% returns to our members in period of 1 to 2 years. Total 5 stocks of 2015 have already achieved their target price. As illustrated in the table above, average returns (as on date) of our Hidden Gems stocks released in 2015 is 45.4% compared to average returns of 9.4% of small cap index, out performance of 36%. 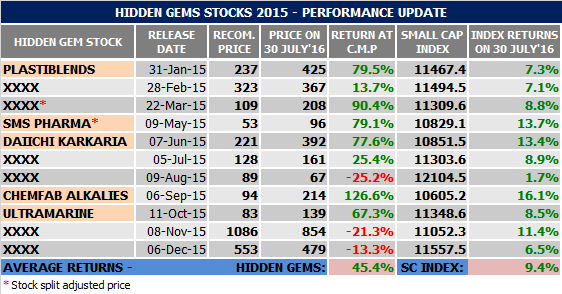 Our Hidden Gems stocks of 2016 released so far have also outperformed small cap index. As on date average returns of our Hidden Gems 2016 stocks is 38.5% compared to small cap index average returns of 11.6%, out performance of 26.9%. And that's not all! 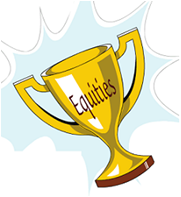 We have a strong history of exploring multibagger micro and small cap stocks. It gives us immense pleasure to share that 35 out of 52 Hidden Gems stocks released in last 6 years (till Dec'15) have given returns above 100%. Moreover, 25 out of these 35 Hidden Gems stocks have given returns in the range of 200% to 1900%. We are pleased to inform that we are celebrating this festive season by offering maximum benefit to our members. You can avail discounts up to 30% and valuable freebies on our subscription services under Saral Gyan 6th Anniversary Offer. Subscribe to our services and get rewarded by making smart investment decision in equities. Hurry! Last 2 Days... Offer will disappear on 31st July 2016 at 11.59 pm. Click here to know more about Saral Gyan 6th Anniversary Offer. Note: Subscription cycle for all new subscribers joining on or before 31st July 2016 will be July 2016 - June 2017. Existing members can also renew their subscription during ongoing offer, subscription period will be extended by 12 months in case of renewal. Hidden Gem and Value Pick of July 2016 is still not released and is expected to release during 1st and 2nd week of next month.